What do you get when you combine 4 sopranos, 8 altos, 4 tenors, 4 baritones , and 1 bass saxophone in a concert hall with some of the best classical arrangements to come along for the saxophone? 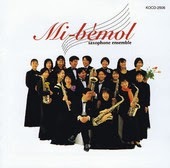 You get the Mi-Bemol saxophone ensemble of course. On display on this disk is the kind of group technical mastery that every musical organization should listen to. The intonation, articulation and phrasing here are fine examples of what dedication to your instrument can become in a group setting. Every horn is dynamically perfect and every phrase flows the next. If you didn’t know any better you would swear you were listening to a traditional chamber ensemble. As is customary in my reviews I have to address, what is in my opinion the best part of this ensemble, the low saxes. The bottom end is built on the bass saxophone and baritones. The bass player must have lungs the size of a whale to be able to support the long flowing lines “Dreams of Love NO.3″. His string bass like tone anchors the low end like no other can. The bass is supported by the powerful baritone section. Their 4 cello like tones fill in the mid and upper regions of the low end and offer the perfect bridge between the Tenor section and bass. The best example of the low saxophone section can be heard in “Serenade op.48” by Tchaikovsky. Seeing as this is not a band composed of low saxophones I am compelled to offer praise to the remainder of the band. The altos filling the role of the violin is fantastically well arranged. Their combined power and tone ads a string like quality that no other woodwind ensemble can replicate. The real surprise is that the the entire alto section is amazingly in tune at all times. It is proof that more than 1 alto player can indeed play in tune, at the same time no less. Now if you’ve never played tenor saxophone in classical music then you know that feeling of being the odd person out. While you are the darling of the jazz scene when you get to classical music you are the red-headed stepchild of the saxophone family. You always have supporting lines and every so often are given a moving line with, wait for it, several 8th notes in a row that you share with the 5th clarinet. bass clarinet, bassoon, 3rd trombone, and 4th trumpet. Yeah it’s about a boring a role in music as there can be. You pray for a soli passage in which you can make you line shine only to be waved quite by a conductor who favors the alto portion of that line. As you can imagine I’ve done my time on a tenor in a classical ensemble. You might expect that the tenors would get similar treatment in this group but I am happy to say that it is not the case. The tenor role in the group is that of the viola. They support the altos from below and add tremendous depth to the mid-tones. I can say with confidence that this group would sound only half as good as it does. Yes, I am attributing a great value to classical tenor at this moment but it is very well deserved here. The sopranos are the sizzle and likely to be the players working the hardest in this group. To keep 4 soprano saxophones anywhere near in tune for greater than 20% of the time is a feat deserving of a Nobel prize. It’s almost impossible to consider how hard these 4 musicians must have worked to lock in the intonation and keep it there through the fast moving lines. The sopranos are playing the role of flute, clarinet, oboe, and piccolo. This is no small endeavor for any group of musicians but they pull this off so brilliantly that you have to acknowledge the greatness of the feat. TAKE AWAY: This group is what Adolph Sax envisioned in his head as he slaved away in his workshop. He had to know at the time that what he made was to be the most flexible, beautiful, adaptive, and responsive of the woodwind family and in turn the most amazing. This album would please Adolph as much as it pleased me and I’m sure it will please you as well. Although I do recommend 1 more bass saxophone, might I suggest a certain writer for MBS?